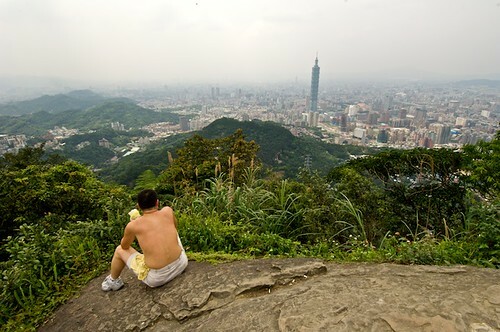 The 9-5 Peak (Jiuwufeng – 九五峯) is the pinnacle of the Four Beasts Mountain trail system. 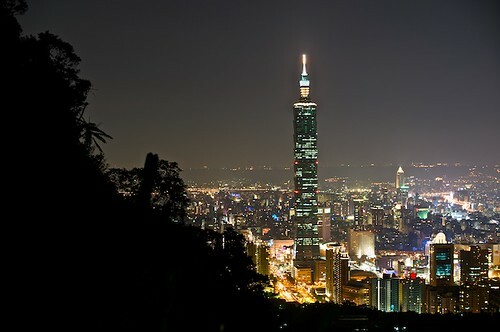 It’s a mountain that dominates eastern Taipei and rivals even the mighty Taipei 101 in height. 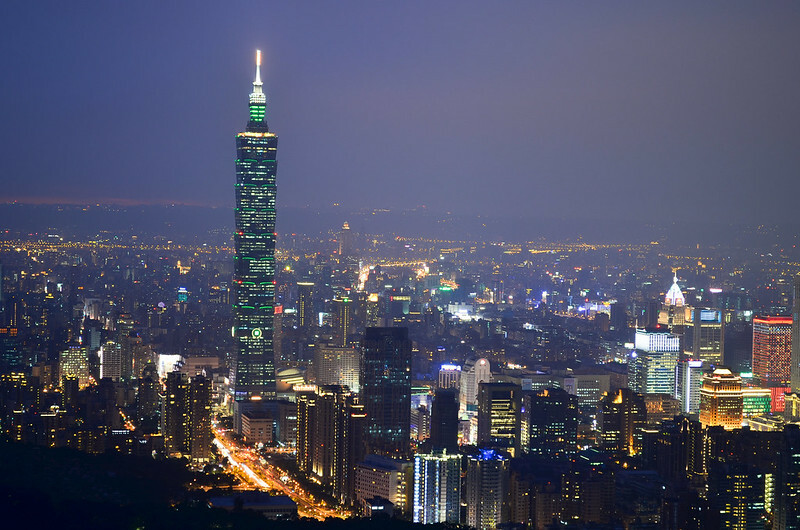 The Fours Beasts Mountains have many fantastic views of Taipei 101 and Taipei City. My favorite time to visit the Four Beasts is at night. You almost have the trails to yourself. 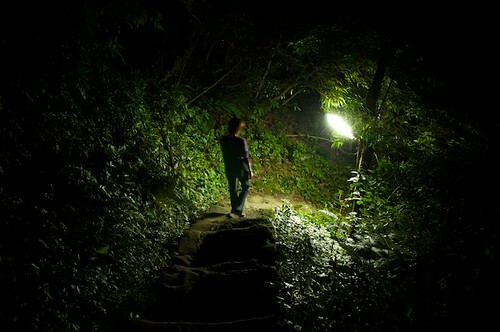 The trails are well lit, but a taking a flashlight is recommended. There are many old, interesting buildings along the trails. 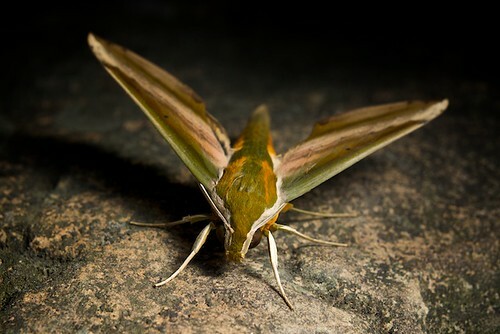 There are lots of insects, toads, bats, and other creatures all over the Four Beasts Mountains. Hiking during the day can get a bit crowded, but offers endless interesting sites. There are many rest areas, work-out areas, and home-made meditation areas. Along one trail going to 9-5 Peak is a strange, artistic village. 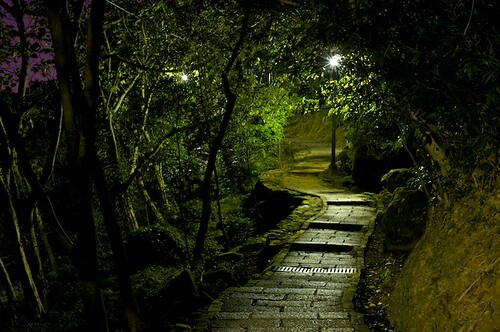 It's well kept and a nice place to relax and soak up some peace. 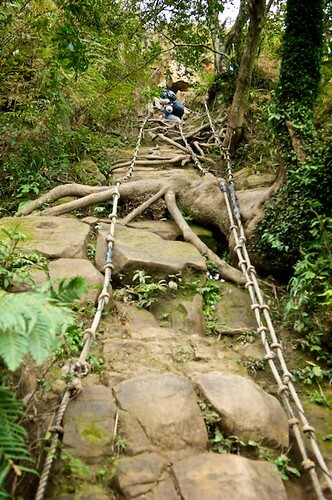 If you venture down some of the dirt paths that shoot off of the main ones, you’re sure to find some ropes to climb. These trails crisscross the whole mountain and could keep you busy for an entire weekend. Following some of the dirt trails that shoot off the main trails may lead to some fun ropes to climb. 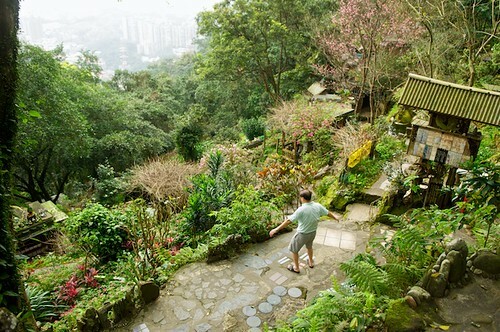 Taipei is lucky to have these lush forest escapes so close to the city. 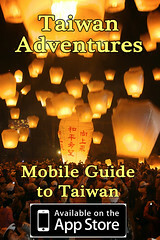 Check out Hiking Taiwan’s recent post on this area too. 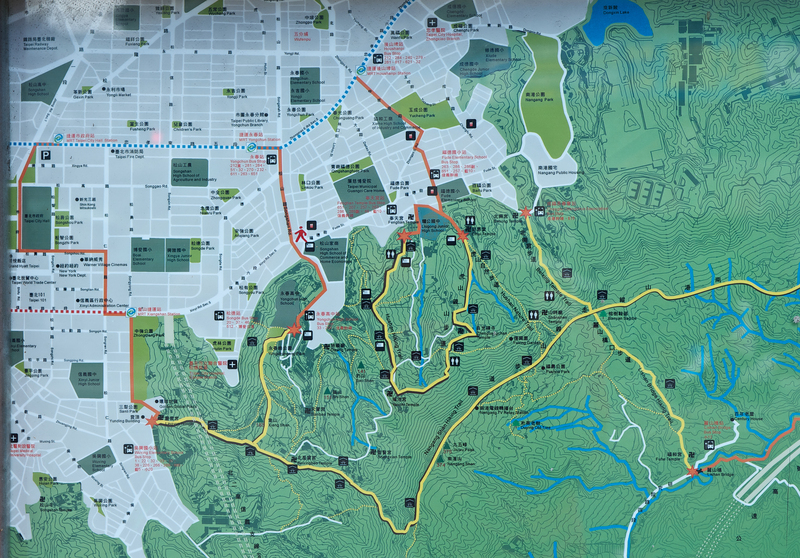 This is part one of a three part series on hiking the Four Beasts Mountain trails. Part two is on Tiger Mountain and part three is on Elephant Mountain. Great shots especially the night ones. It’s been a couple of years since I’ve been up there – I’ll have to make a trek up sometime soon. Check back in a few days and I’ll have part 2 up! Great series Neil! 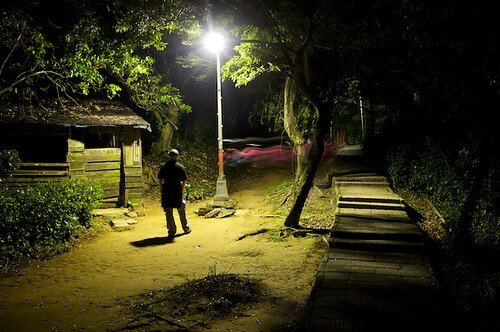 I’ve been up these trails during the day, but it looks like the real fun starts after dark! 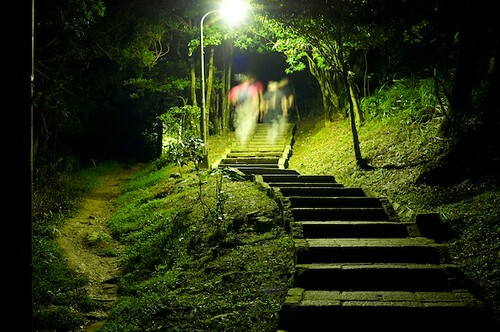 Are these trails busy during the late evenings on weekends? 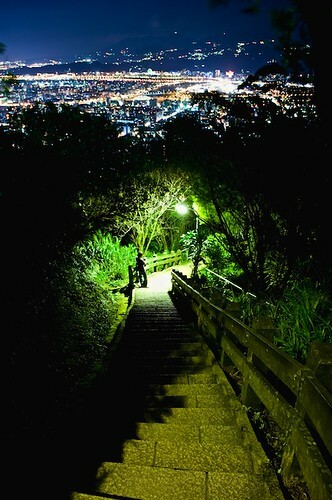 A lot of people go up for sunset, then come down just after dark. Elephant mountain is the most busy but the other ones are alright. If you’re looking for solitude though, the weekday evenings can’t be beat! Exactly! Taipei is lucky to have all of these! I like the last foto. It looks like there are 2 different worlds in it! Are there any public toilets up the mountains? Yes, there are quite a few scattered across the mountains. I love reading your blog! We are planning to go to Taiwan early next year. How long does it take you to hike the Four Beasts? 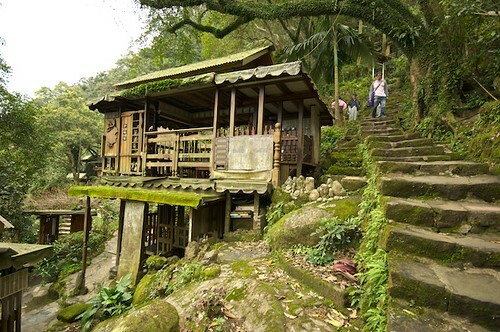 There are lots of trails up there, and you could spend all day going up and down and visiting the temples, but most people can do the Tiger Mountain -> 9-5 Peak -> Elephant loop in about 4-5 hours. That looks like a fun hike. Do you happen to know the elevation of the various mountains? The rope sections looks like a lot of fun! Those mountains are not very high. Elephant is about 180m and 9-5 Peak is about 375m. They’re not high, but there really are a lot of nice things to explore. Thanks so much for your maps! I had trouble finding ther trails before I saw the maps and loved the four beasts! wow! Would there be space left on elephant mt. new year night? Must be a lot of photographer there. Not really. People start saving spots 24 hours before the fireworks. IF you go up just a few hours before the fireworks, you probably won’t even be able to see them.